A French drain or a drain tile, is made when a trench is filled with gravel and many times a perforated pipe at the bottom of the trench is used as part of the drainage solution. 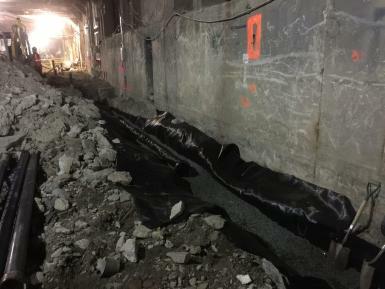 A geotextile fabric wraps the pipe and gravel so it can act as a sieve where fine sediments will not pass to the area where the gravel is located. A French drain, when properly designed, will reduce pressure exerted upon retaining walls and subgrade walls that with time can induce moisture inside basements and crawl spaces. This drainage system is an indispensable component of moisture control. The drainage system should not be more than 12 inches wide, between 6 and 8 inches will be ideal, because it will probably last longer and water will be collected and transported better with less obstructions. As a good practice, you can also have at least 2” of gravel around the pipe and the geotextile fabric used must be installed so the pipe is completely covered with it. The pipe installed in the trench must also be installed with the holes on the bottom. A French drain must be installed properly; otherwise cost will add up and reduce your profit. The drainage system should be installed deep enough, so water will eventually run into the pipe, instead of moving near or into the structure. The usual recommended slope of the perforated pipe for a French drain system is one inch drop per ten feet horizontal run. How deep does the pipe must be installed? Well, that depends on the application of the drain. If a French drain is used to protect a living space, the invert of the bottom shall be placed at least 2 inches below the level of the finish floor.